If you are a greencard holder, what are your rights in the case of divorce? Can you use the Form I-864, Affidavit of Support to recover support from your spouse? That depends on the details of your case. The Form I-864 is signed by the US citizen/resident during the immigration process. By signing the Form I-864 the sponsor promises to provide support to the immigrant. He promises to ensure that the immigrant has income equal to at least 125% of the Federal Poverty Guidelines. The support obligation lasts potentially forever. It stops if the immigrant is credited with 40 "quarters of work." In some situations it also ends if the immigrant departs the United States. But divorce does not end the I-864 support obligation. 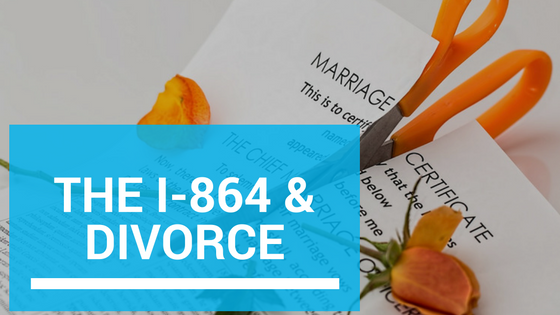 The Form I-864 and divorce. If the immigrant divorces her US husband, she may be entitled to support under the Form I-864. In fact, she may be able to get I-864 support even if she cannot get alimony. To qualify for support, the immigrant would need to be earning less that 125% of the Federal Poverty Guidelines. For a household of one that is $1,238 per month. If the immigrant is earning that much or more, then the sponsor is not required to provide support. But if the immigrant is unemployed, or earning less than $1,238, then the sponsor is required to make up the difference. Can I bring up the I-864 in divorce court? If you believe you are entitled to support under the I-864, what do you do? Unfortunately the answer is complicated and varies from state to state. (The easy answer is ask us - we're happy to offer you a case assessment at no cost). In some states, judges will consider the I-864 in a divorce case. The judge may be willing to enforce the I-864 and to award alimony based on the I-864. But in other cases, divorce courts refuse to enforce the I-864. In those states, the courts believe that the I-864 should be enforced through a separate lawsuit. Those courts say that alimony laws cannot be used to enforce a federal contract like the the I-864. Should you "play it safe" and raise the I-864 in divorce court? Not so fast. That could make it impossible for you to bring another lawsuit later, if a judge refuses to enforce the I-864. This is a legal principle called "issue preclusion" or "collateral estoppel." Under that rule, someone is not allowed to bring a second lawsuit to raise an issue decided in a previous lawsuit. So if a divorce judge rules against you on the I-864, that could prevent you from bringing another lawsuit to enforce the I-864. Generally, a separate lawsuit should be brought to enforce the I-864. This lawsuit can be started even while a divorce case is continuing. In fact, it is usually best to bring the lawsuit as soon as possible. This prevents the defendant from arguing that the I-864 should have been raised in the divorce case.